With an average temperature of 20 to 30 degrees cooler than that of the surrounding Nevada desert and a short 35-mile drive from Las Vegas, Mount Charleston is the perfect day trip for nature enthusiasts visiting Sin City. Rising from the desertic landscape near the border of California, Mount Charleston is one of the highest elevations in Nevada and provides visitors with ample opportunities for hiking, skiing, picnicking, and horseback riding. Whether you plan to just stay a day or want to spend the weekend camping or enjoying the fine accommodations of the Mount Charleston resort, are down for a hiking trip or fancy a tandem skydiving adventure, there's plenty in store for visitors to the Spring Mountains National Recreation Area of the Humboldt-Toiyabe National Forest. If you find yourself with a free day or weekend in Las Vegas, all you need to do is look to the snow-capped mountain to the northwest—visible nearly half the year from the Vegas strip—and you've found the perfect getaway from the chaos of the city. No matter which way you're coming from, you'll need a car to get to the base of Mount Charleston and a quick hike to get to Charleston Peak. If you're traveling to Mount Charleston from Las Vegas, head north on US-95, and if you're traveling south to Las Vegas, take US-95 South until you come to NV-157 Crossing, where you'll take the exit and travel around 18 to 20 miles up the mountain (to the west) before arriving first at the Resort on Mount Charleston than the vacation homes of "Rainbow" and "Old Town" villages. Once you get to a bend in the highway where Echo Road leads off straight ahead, you'll want to take Echo road to get to the North Loop / Canyon Trail trailhead or veer off along NV-157 to arrive at the South Loop trailhead for hiking the mountain itself. In addition to year-round hotel accommodations and tours, full-service camping is also available from May through September, so whether you're just traveling to the mountain for a day or hoping to spend a relaxing weekend doing outdoor activities, you'll be sure to find comfortable lodging in this quiet mountain town. If you're backpacking the trail, there is plenty of space to camp alongside it—make sure to grab an official brochure at the trailhead for up-to-date information regarding camping rules and regulations. The Forest Service encourages people to camp away from streams to protect local wildlife and at least 200 feet away from the trails. There are also a number of Forest Service campgrounds along NV-157 including Kyle Canyon, Hilltop, and Fletcher View, which oftentimes fill up on summer weekends, so you may not find space if you arrive too late in the day. Additionally, because it's only about an hour max from the Las Vegas strip, you could always stay at a hotel near Vegas and make a day trip of hiking Mount Charleston. Otherwise, you can stay at one of the two hotel resorts near the trailheads: Mount Charleston Lodge or Mount Charleston Hotel. Although there aren't many activities listed through the Forest Service at Mount Charleston or Charleston Peak, there are a number of great vacation options through the two hotel resorts nearby including skiing, horseback riding, and even a tandem skydiving package. Still, even if you don't visit one of the resorts, hiking, picnicking, and camping are all free to visitors of the Spring Mountains National Recreation Area. Unless you are in peak physical condition, prepare for the possibility of not reaching the summit as this hike is difficult for the average flat-land-living tourist. Take plenty of breaks along your journey and be sure to enjoy yourself as you're surrounded by some of the most beautiful natural landscapes Nevada has to offer. You should bring a hat to protect yourself from the unfiltered sun, a windbreaker to fight off the 20-degrees-cooler-than-Vegas winds on the mountaintop, and a flashlight to guide you down the trail if you happen to get stuck on the mountain after dark. 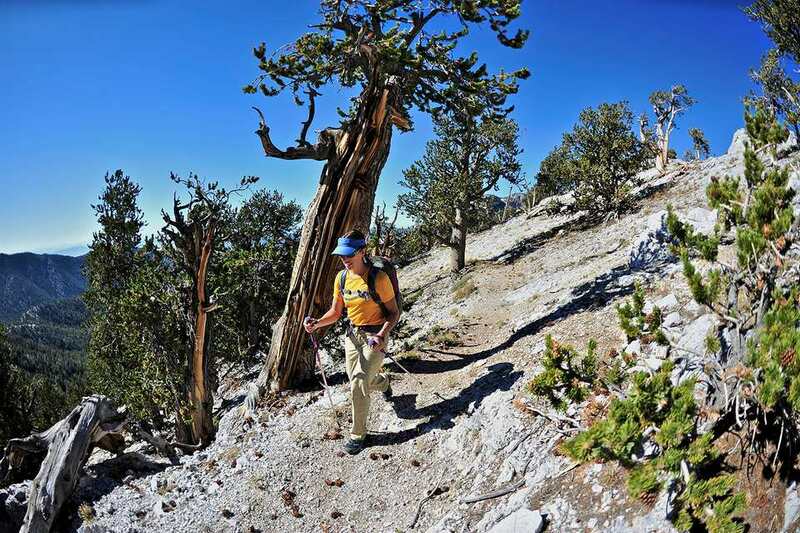 Other than a library and the hotels near the trailheads, there are no significant services near Mount Charleston or its trailheads. Visitors should stock up in Vegas for snacks, supplies, and even gas before traveling to the mountain. Additionally, parking fills up on the mountain quickly, especially over summer weekends, but it's generally acceptable to park along the side of the road near the trailhead. What Do You Do If You Only Have One Day In Las Vegas?